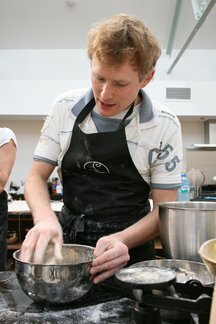 Our 3-day Bread Masterclass workshop is always a crowd favorite. By the end of just three days, you will have clocked in some good bread-mileage and traversed the terrain of starters and overnight doughs, pizzas, sweet treats (warm, jammy doughnuts anyone? ), luxuriously enriched breads like brioche or pain viennoise and so much more. When you return home, you will be sparked with the confidence and techniques to regularly make sublime bread for you and yours. Very few things are as personal, and meaningful as that. We are very fortunate to have master baker Rossa Crowe of Le Levain Bakery join us on one of the three days for a very specialized look at artisan breads. (We work here, and we’d book in for Rossa alone!). Rossa Crowe has been guest baker at Lynda Booth’s Dublin Cookery School since the very beginning and there is no one we have met who is more passionate or knowledgeable about bread. After working for over six years in small artisan bakeries in the south of France, Rossa opened his own bakery Le Levain in Dublin, where his breadmaking is based on a natural fermentation method that was standard in 18th century France but very few bakers use today. Every visit from Rossa is hotly anticipated and very special for both our team and students. Breadmaking has a rhythm of its own and our daily schedule will take a cue from the timing of our breads’ proving, rising, and baking needs. As a reflection of this, every day will be interspersed with 3-4 Demos and 3-4 Hands-On sessions. You can expect to receive your own recipe packs for all the various breads we cover and accumulate quite the new repertoire by the end of the week! We will also incorporate a light lunch into our schedule every day to keep you fueled. On all our regular days, this is when we wrap up. On our last day, we include an extended lunch, pass around the wine and raise a glass to our new-found baking friends. Thank you so much for spending a few days with us. This culmination of intense learning and immersion into a subject you love is a full-on experience but at the end of it, we always feel like the time absolutely flew by. We appreciate all feedback and look forward to welcoming you back again very soon!